World Arthritis Day is celebrated in the month of October to spread awareness about arthritis and related bone diseases. European League Against Rheumatism (EULAR) is an organisation that represents the people with arthritis. It aims to educate people through online courses and programs. This year EULAR has launched a social media campaign called, ‘The Future in your hands’. This year’s theme , ‘The Future in your hands’, aims to put the responsibility of staying healthy in the hands of the patient. People can work from the start towards a healthier lifestyle, in order to avoid diseases and complications in the future. It aims at promoting international activities for facilitating the lives of those affected by Arthritis. According to a top orthopedic doctor in Gurgaon, here are a few food items that Indians include in their daily diet. 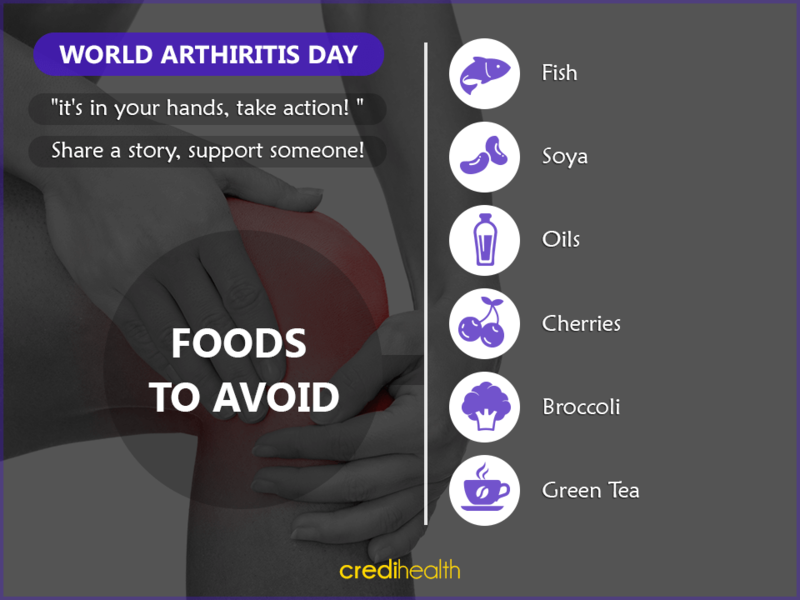 However, these foods should be avoided if you have arthritis. These food items contain sulforaphane. Sulforaphane slows down cartilage damage in joints. Fatty fish are rich in Omega-3 fatty acids. These help fight inflation. Incase fish cannot be eaten, Omega-3 supplements must be included in the diet. Soya diets also helps fulfill the body’s necessary Omega-3 requirements. These contain compound diallyl disulphide that helps fight a number of diseases along with arthiritis. It helps limit many cartilage-damaging enzymes. The cherries owe their red colour to a compound anthocyanin. It helps provide relief from arthritis pain. Turmeric is a natural antiseptic and helps fight many diseases ahile keeping othetrs at bay. It is a spice that contains curcumin, which helps prevent inflammation. Antioxidants in vitamin C help prevent many diseases but there intake in large quantities may result in kidney stones, as per a recent study. Green tea improves bone quality and strength. It thus keeps the bones strong, in turn preventing pain due to arthritis. Credihealth is India’s No.1 Medical Assistance company. Credihealth gives guidance to a patient from the first consultation through the entire hospitalization process. A team of in-house doctors helps the patient find the right doctor, book appointment, request cost estimate for procedures and manage admission & discharge processes. Get FREE medical assistance to select the Best Orthopedist in India from trusted hospitals.